Kent Hovind – Chris Pavey – The County Commissioner! – Kent Hovind v. Robert Baty – The Great Debates! Home→Kent Hovind – Chris Pavey – The County Commissioner! Chris Pavey is a businessman from West Virginia. He owns and operates Grace Towing and Recovery. Chris is approaching retirement time and plans on retiring to rural Conecuh County, AL where he recently acquired property and has started moving in. A few weeks ago he happened across my dedicated Hovind FaceBook page in his effort to research the fellow, Kent Hovind, he heard was trying to buy property next to his and set up some kind of amusement park. Chris didn’t want an amusement park next door. Chris is also a “Fundamental Baptist” similar to Kent Hovind. I explained my take on the Hovind situation. Ultimately, according to Chris, he was able to buy up the property Kent was intending to purchase. Currently, it appears Chris is planning on relocating his Grace Towing and Recovery to the property and expanding to include a convenience story, service station and maybe even a McDonald’s. It is right off I-65. This seems to be story we will be hearing more about. 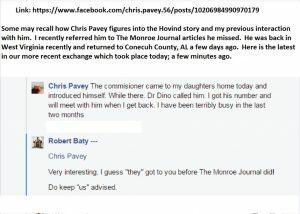 The Monroe Journal, located in Monroe County which is contiguous to Conecuh County, has run 3 stories on the Hovind situation and may be planning to run more which may include input from locals like Chris, religious leaders, the Sheriff, and the County Commissioner. As the story develops, many others may be featured in the local media coverage as the Hovind property continues to develop. Thanks to Kent Hovind and his people who have never stopped in their campaign to attack me and mine, the link below is no longer accessible. However, I did happen to keep a copy of the text. If anyone becomes aware of any response from Kent Hovind or his people, please let us know. Mr. Hovind, I live in the area that you are seeking to purchase land for your new Dinosaur Adventure land. As a potential neighbor to you, I have attempted to contact you by email asking you to call me that we may have a conversation, yet you chose not to call me. Now Sir, I wish to state that I am a Christian and fully support the ability of Gods people to bring Glory to his name and leading the lost to Christ as their personal savior. However, I have concerns about your past that are quite disturbing. I wish to say that before I walked into the Kangaroo gas station a couple of weeks ago at Highway 41 and I-65 and the woman there telling me that the land next to my farm was being purchased for a water park, I had never heard of you. My first concern was walking out on my deck and seeing flood lights from the park and removing the beautiful scene that I so enjoy. The loud noises sweeping across the open field to bother my evening of watching the animals graze in my fields. The potential for other bustling noises and people which just goes against the grain of this area. This is my concern and the reason for which I wished to speak to you. Having said that, I began to investigate who my new neighbor was going to be and boy was I in for a shock. I have spent much time investigating your issues and I am really concerned of the person you are. Now I am not casting the proverbial stone as I have many issues in my own closet, but as a man of God, which I am not, You have a DUTY to present yourself above the rest in your service to God. You continue to fight and keep the fray alive is a detriment to your ministry and is hurting the God that you serve. But above all that, the one issue that really irritates me is the treatment of your wife. Your wife followed Gods commandment to her, by being submissive to you and doing as you told her to do, however you failed her in Gods commandment to you by loving her as Christ loved the church. To me, that shows a lack of morals that makes you unfit. In my opinion, if the time came that I was being charged with any crime, I would have plea bargained to make sure that my wife did not suffer for my wrongs. Before you can fix any of this, you must accept responsibility for your wrong doing. The Federal Government just doesn’t pick a minister out the blue and say lets get him for tax evasion. My father was a Pastor when he was alive, and my ex father in law has served God for 65 years as a Pastor, and never once was investigated by the IRS. Matter of fact, his precious wife worked for the IRS. God will not bless you or your ministry as things are now. Yes you may get the money together to buy your land and defeat the IRS by putting it in someone else’s name but then again maybe you wont. God protects those that serve him and those he loves. Lord knows he has protected me all my life and yet I have failed him every day in my service to him. I will pray for you Mr Hovind and ask God to bless you and ask God to open your eyes to the truth. As I said, I fail him daily and feel compelled to tell you that the main purpose in our lives as Christians is go and teach those about Christ, not to argue or debate aspects that have no bearing whatsoever on whether a person accepts Christ as their Saviour. When I see you antagonize atheists on your program, I think that you should pray for them rather than incite them to hate you anymore. Just a word from a sinner who is saved by the Grace of God and fails him daily. 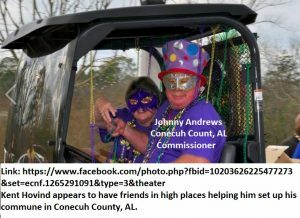 Johnny Andrews, Conecuh County Commissioner, contacted me a few weeks ago, thinking I was Kent Hovind, and the following exchange took place via the private messaging feature available at the link indicated. Are you suggesting I call that number and if so for what purpose???? Per our earlier conversation this am. I don’t recall an earlier conversation this AM. Perhaps you have me, Robert Baty, confused with Kent Hovind????? No, I am Robert Baty, Kent Hovind critic. Sorry, this is for Kent!